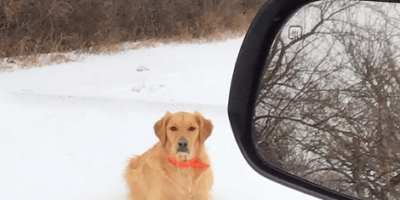 Mom Makes An Incredible Video Dedicated To Her Photogenic Pup! It is impossible to deny the fact that our pups are incredibly important to us. It is no wonder, then, that our camera folders are just bursting at the seams, filled with pictures of our precious pups! An understandable behaviour, really- how could we possibly resist just how photogenic our beautiful pooches? This Mom, after noticing her phone was starting to run out of space and her gallery was overflowing with photos of Gus, her Golden Retriever, she decided it was high time to do something. It was time to make a video dedicated to her gorgeous pup! The result is a video montage full of photos of Gus in all sorts of positions. Most of these photos are taken at home, while he is snoozing away or at rest. It is easy to guess why – Golden Retrievers are pretty hyper pups, so that is likely the only time this Mom can take a clear photo of him at all! Adorable Pups Get Super Excited When It Snows In Their Playpen! Every Pup Has Some Things They Love Most! Check Out This Pup’s Favorite Things!